Volcanic eruptions, like the sudden reawakening of Mount Etna in Italy earlier this month, seem like classic acts of God — unpredictable, rare, spectacular, sometimes deadly. But volcanic eruptions — which result from the earth’s internal heat gradually leaking into the cold blackness of space — are actually a regular occurrence. Every year, an average of 50 volcanoes erupt around the world, many in remote locations but some in the midst of dense populations. Deaths occur nearly every year from volcanic eruptions, and mass evacuations are common. Despite their risks, volcanoes exert a primordial allure. When Mount St. Helens reawakened in the early spring of 1980, thousands of people flocked to the mountain to cheer on the puffing volcano and take photographs. Only when the mountain violently blew up a couple of months later, killing 57 people and flattening more than 200 square miles of forests, did its destructive potential become clear. For that matter, only last month I was standing on the rim of Vesuvius, overlooking the Italian city of Naples and the ruins of Pompeii. Though the mountain has not erupted since 1944, watching steam billow from the crater walls was a disquieting reminder of the forces active beneath our feet. Volcanologists have become much better since Mount St. Helens’s eruption at predicting when a volcano might blow. They can track the movements of magma using seismic detectors and GPS receivers (though many dangerous volcanoes, including ones in the United States, still lack monitoring equipment because of funding shortfalls and red tape). They can measure the chemicals given off by molten rock in the air and water around volcanoes. 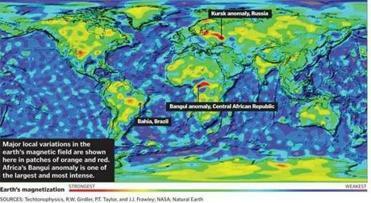 What’s behind the Bangui Magnetic Anomaly? Some experts see an ancient meteor strike. But knowledge of what is going on beneath the earth’s surface is inevitably limited. When Mount Ontake erupted in Japan in 2014, also killing 57 people, no premonitory earthquakes provided warning. Lava flows and ashfall can travel in unexpected directions depending on the surrounding geology and weather conditions. The strongest eruptions tend to occur at volcanoes that have been quiet for a long time as magma gradually accumulates. Even when scientists are able to predict an eruption, warnings can be inadequate, overlooked, or ignored. When the Nevada del Ruiz volcano erupted in Colombia in 1985, nearby residents received insufficient warning, and more than 23,000 people died. The danger zones around Mount St. Helens were much too close to the volcano because public officials did not want to encroach on private property. 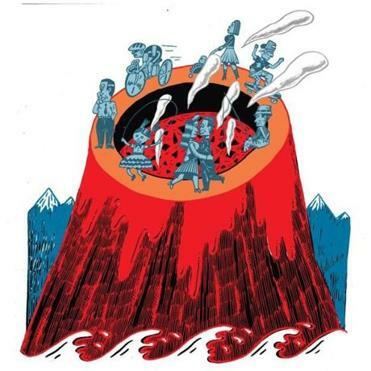 The capriciousness of volcanoes recalls Will Durant’s observation that “civilization exists by geological consent, subject to change without notice.” The earth’s landmasses, along with its oceans, atmosphere, and icecaps, form a nonlinear system that can lurch from one state to another with little or not warning. We know that cataclysmic events will continue to happen: One of the Cascade volcanoes will erupt again (by some reckonings, we are overdue), great earthquakes will strike the West Coast, hurricanes and tornadoes will continue to ravage the South and Midwest, and greenhouse warming will change the large-scale behavior of the ocean, atmosphere, and ice sheets. But the exact timing, location, and magnitude of these events remain unknowable. Here in the Pacific Northwest, we tend to downplay the risks of our regional geology even as we celebrate the landscapes it has produced. More than 100,000 people live atop volcanic mudflows that have cascaded down Mount Rainier over the past few thousands years. If Mount St. Helens had erupted on a weekday rather than early on a Sunday morning, hundreds of loggers and sightseers in the surrounding woods would have died. When a mega-quake hits the Seattle area, as has happened many times in the past, the city will be devastated and the death toll could be in the thousands. Common-sense preparations are both inexpensive and effective against geological disasters. Sirens in floodplains and tsunami zones can give people a few minutes to get to higher ground. The drills done on national ShakeOut Day (Oct. 15 in most states) could save many lives if they were more widely performed. Retrofitting old masonry buildings is more expensive, but no emergency planner denies that it needs to be done. Future geological calamities will inevitably occur. We don’t need to be surprised when they do. Steve Olson is a Seattle-based writer and the author of “Mapping Human History.” His next book, “Eruption: The Untold Story of Mount St. Helens” will be published in March.